Getting the quantities exactly right for building materials is not a walk in the park for construction companies, but one Bridgewater builder has come up with a unique plan to re-purpose leftover supplies from custom builds that will have dogs wagging their tails. 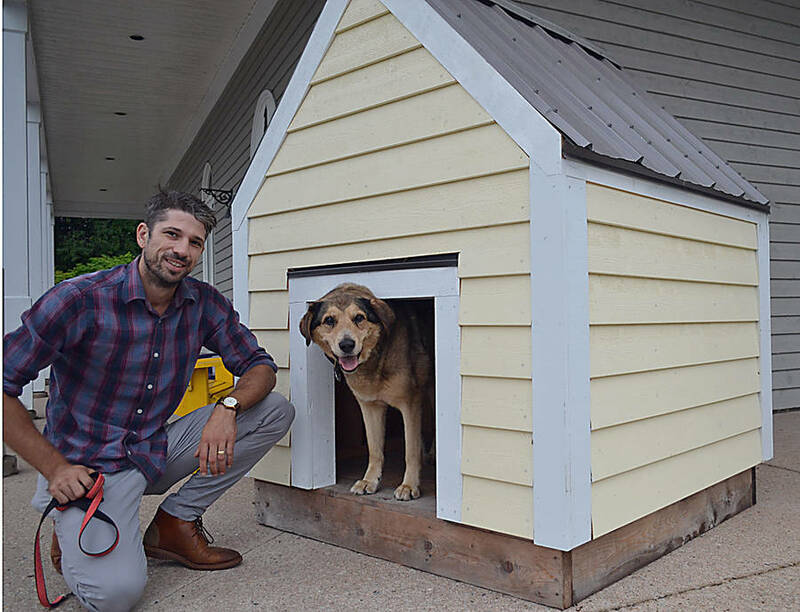 Tilia Builders Inc. has built a dog house out of left-over materials from a custom home build in Chester Basin and is raffling it off with the proceeds to go to Elderdog, the national charitable organization based in Feltzen South. Liam Finney, who along with Michael Mandale, is a partner in Tilia Builders, came up with the idea. "It was just sort of a brainwave that I had while thinking about it on the drive home," he told LighthouseNOW in an interview. Finney explained that most builders will order an excess of material they believe are needed for a job to avoid being caught short and having to wait for more supplies mid-construction. Materials specific to custom homes are necessarily easily re-purposed to other builds. The high-end home Tilia had been working on for the general contractor, Cross Ridge Construction Inc, had left-over custom colour-matched materials, which couldn't be used on another build and there wasn't enough left to do a lot with, says Finney. "But here was enough to build something small," he added. The owners of the home, which is a seasonal property, were willing to have the excess materials made into a dog house, even though they themselves were not in need of one. Since his wife is a veterinarian technician at the South Shore Veterinary Hospital, Finney thought, "maybe we could make something of this." As owners of an elderly dog themselves, they appreciated the efforts Elderdog makes in improving the lives of aging dogs and senior citizens who may be happy to be with them. They approached the charity and it has now secured a license to raffle off the dog house on October 1. As well as Elderdog Canada, Tilia is partnering on the project with Cross Ridge, South Shore Veterinary Services and the UPS Store in Bridgewater. Raffle tickets soon will be available for sale at Nova Scotia Building Supplies, Chester Building Supplies, Farmers Co-op, The Dog Shop, Pet Valu and Pets Delight Dog Grooming, and additional vendors may be named in the coming days. The dog house can be viewed at the entrance at the South Shore Veterinary Hospital on Highway 325 in Wileville. Finney says he can see other such builds from excess materials in the future. "This is a process that stands to be repeated if it goes well," he said.